Wouldn't you love to eat organic gourmet food by a world famous celebrity chef?! Well, your BABY can! Sprout, is certified organic baby food and only made with the freshest, purest ingredients by executive celebrity chef, Tyler Florence. It's made entirely without preservatives, sugars, starches or fillers. He has created fantastic combinations such as: Roasted Pears & Apricots, Pasta with Lentil Bolognese, and Summer Squash with Yukon gold potatoes & parmesan. Doesn't that sound yummy? Mama likes! Tyler Florence, who is a father of three himself created Sprout to encourage healthy eating habits from the start and help feed our kids pure, nutritious food. The consistency of the food is a puree form just as if you spent hours cooking it at home. They come in a neat convenient pouch (no jars that can break) and are completely resealable to put away in the fridge. If you want to heat the food you put the sealed pouch in a bowl of hot water until the temperature you want is achieved. So what do you do with the pouch after consumption? Sprout has partnered up with TerraCycle and is encouraging you to send in your used pouches to create a second life for the packaging by creating fun and unique sold at major retailers and for every package received TerraCycle will donate 2 cents to a non profit organization or school of YOUR choice! I think Sprout is an amazing brand that parents will love and better yet your babies will enjoy! Bon Appetit! 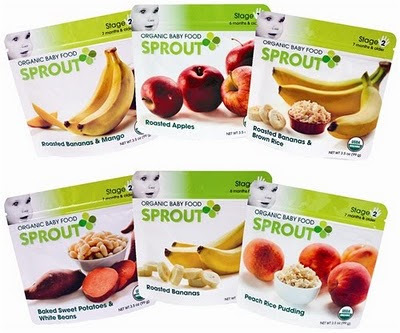 Go to www.sproutbabyfood.com to find out which one of your local grocery stores carry Sprout or go to www.diapers.com or www.amazon.com to purchase online.